Don't let a pack of gum take away next autumn's great days afield. Did you know a pack of chewing gum could kill your bird dog? I had never heard of such a scenario until receiving a forwarded USA Today article about the toxicity of chewing gum ingredient xylitol, from Paul Hanson, a member of Pheasants Forever's National Board of Directors. Worried this article was mythical internet propaganda, I forwarded the story along to PF's regional field rep for Ohio, Charlie Payne, whose father is a renowned doctor of veterinary medicine. The information you got on xylitol is correct and it is very dangerous to dogs. If xylitol is the first ingredient on the label, a single stick of gum can be very serious for dogs. The first symptom of toxicity is low blood sugar and the symptoms would be weakness and even seizures. At higher doses, dogs can go into liver failure. As I said before, a single stick of gum could be toxic to most dogs and an entire pack (the usual for most dogs) would be very serious indeed and possibly fatal. If someone knows their dog has ingested candy or gum with xylitol, they should seek medical attention for the dog immediately. Clinical signs will be seen generally within 12 hours of ingestion, but could be much quicker with higher doses. Any dog that has weakness or seizures associated with a low blood sugar could be a xylitol victim. I was certainly aware of chocolate's toxicity to dogs, but gum, raisins and grapes were new to me. 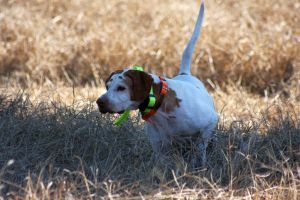 How about you, has your bird dog pup ever had a problem involving xylitol?